Landhuis Winterberg, a beautiful country house located right by the slopes of Snowworld Züschen, is a dream come true for a great holiday. The house is in a fantastic spot at the edge of the forest. In winter it is a paradise for both downhill and cross-country skiers. And in summer hikers and cyclists will be in their element. A breathtaking view of the uplands from the terrace and the rooms makes your stay complete. A holiday, a birthday, a wedding, an anniversary, good news, etc. This Landhuis offers excellent opportunities. A country house with 19 fantastic rooms, each with a modern bathroom. Delightful lounge with charming open fireplace and lots of seating. Cooking in or eating out. You can do it all. A beer, a daily special or a full meal. You will find it all in Winterberg. Skiing during the day and going to a concert or cinema in the evening. There are good entertainment options in Winterberg. From bar to dance club, from cinema to bowling alley. There is no shortage of amusement here. Restaurants in abundance and there is even a night club. Winterberg has lots to offer at any time of year, including: skiing (apres ski), snowboarding, cross-country skiing, hiking, mountain biking, cycling, golfing, hunting, birding, karting, horseback riding, quad biking, paragliding, a summer toboggan run and a swimming pool. Pubs and bars with live music, disco bars, taverns, internet cafe. Never any reason to be bored here. But at this Landhuis it's about more than that: the atmosphere, the surrounding area, a country house in a fantastic setting, ambience and a great night's rest. Where is country house Winterberg? The beautiful "country house Winterberg" just before Snowworld Zuschen located is a dream place for a great holiday. The country house is a fantastic place to the edge of the forest on the homberg to Winterberg-Zuschen 11. An eldorado for skiers and cross-country skiers in winter. In summer, hikers and cyclists on their hearts. Breathtaking views from the terrace and rooms on the Middle mountains makes your stay complete. Winterberg-Zuschen is a recognized climatic Spa. Holiday in Zuschen is also good for your health. Why do guests like to country house Winterberg? Our satisfied guests have something to celebrate. A holiday, a birthday, a wedding, an anniversary, good news, and so on. Country house Winterberg offers excellent opportunity for this to celebrate with us. A super setting to impress. A country house with 19 fantastic rooms all with modern bathroom. Nice lounge with cozy fireplace and sits and places to hangout. Possibility to cook or a visit to a restaurant. It can and should all. Beer, daily specials or an elaborate meal. There is plenty to do in Winterberg. Ski during the day and in the evening a visit to a concert or cinema. And after a day of activity, you can sleep soundly. Land home Winterberg come to us because it is the most appropriate location for them. Family, friends, colleagues, everyone comes here because it's awesome. At country house Winterberg involves more: the atmosphere, the environment, the fantastic situated country house, nice hot showers, the atmosphere, sleep well and the price. What's so special about country house Winterberg? The special feature of rural house Winterberg is the House and its location itself. With 30-40 people on a great place. The guests of rural house for a Winter mountain provided a total of product: in a cosy atmosphere and beautiful surroundings and cheap too. People choose Country Home Winterberg because we have a very good working total product. At arrival you will receive the key of our nice Concierge. You can always call him. You do not need to worry about. After your stay makes our cleaning crew the House again tip top. Country house Winterberg meets and responds to the expectations of our guests. You are really out! We do daily as well as possible our best to satisfied guests. It's that simple. Atmosphere and surroundings country house Winterberg. Land home Winterberg experienced the device as pleasant. We are continually working to our guests. Atmosphere is good and warm. Nice fireplace and a private bar. Trendy lounge, beautiful well-kept rooms and located in a clean air health resort. Country house Winterberg plays because of its location perfect in on health. Our concept is strong but simple, walking and cycling routes, and in winter cross-country skiing and skiing. In the immediate vicinity of the mansion within walking distance are the tennis courts of the local tennis association. There are also opportunities for soccer associations to train on the artificial turf field of the football club Zuschen. Country house Winterberg is bustling and there is plenty to do for everyone. 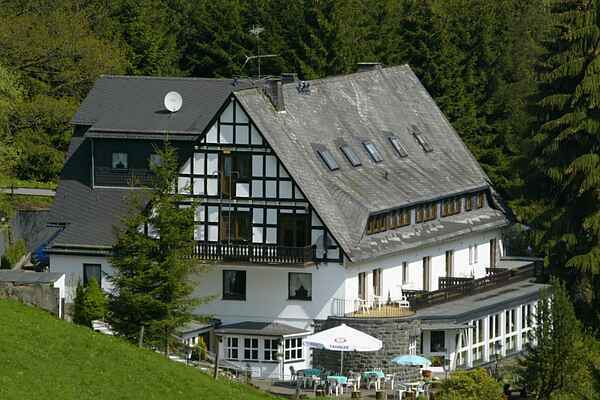 Why sports teams like to country house Winterberg? Sports teams are welcome to country house Winterberg. Beautiful surroundings to train. Country house Winterberg is ideal accommodation for a successful sporting event. Skate teams, cycling teams, tennis teams, mountain bikers, skiploegen, bobsled teams, etc etc etc are welcome. Country house Winterberg as football country house for the training camp of your football team? The top modern artificial turf field can be rented as a training field. Play football on artificial turf and staying in the country house Winterberg. There is a top-class sports atmosphere, sports performance are increasing and country house Winterberg provides all the ingredients to a successful training camp out of it. Your football country house in Germany. Less than three hours away from Arnhem. The country house can safely be called a country house with allure. On the edge of the forest within walking distance (150 metres) a nice artificial grass field. National and international professional and amateur clubs are welcome. Bicycles and mountain bikes are available on request. Going out in Winterberg. In Winterberg is good. From bar to disco and cinema to bowling alley. There is plenty of water fun. Restaurants abound and there is even a night club. Winter mountain has a lot to offer throughout the year such as; skiing (apres ski), snowboarding, cross-country skiing, hiking, mountain biking, cycling, golf, hunting, bird watching, karting, horse riding, quad biking, paragliding, summer toboggan run and a swimming pool. Pubs and bars with live music, disco bars, pubs, Internet cafe. You don't have to be bored. Mission statement: rural house Winterberg looks positively to the future. Country house Winterberg keeps actually take into account the environment in which we operate. Well take care of the nature is our social responsibility. Where possible, we work together with local entrepreneurs and suppliers. For example, we have only our central heating boiler replaced for a clean new. This money also for our guests, this also make more conscious choices. Through the water and electricity usage, there is little impact on nature. Additional effect is to create environmental awareness among guests. Country house Winterberg is a whole new group accommodation far away from urban pollution. It all starts with Green thinking and we are working actively on at country house Winterberg. Challenge: Winterberg is very popular, we do it better than ever. With our new group accommodation concept and the cooperation with Belvilla, we expect another good year in Winterberg. With high-occupancy, so book soon. Our greatest challenge is to our guests. We grow as landlord and understand the market getting better. Country house Winterberg remains responsive to the needs of our guests.